In this post I want to introduce one last philosopher. 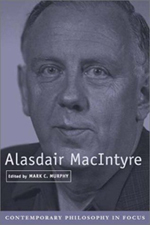 Alasdair MacIntyre is currently a senior research professor of philosophy at Notre Dame. This post will once again deal with the subject of justifying our beliefs. Like Lakatos, MacIntyre provides us with a model for justifying our whole research program or web of beliefs. He has done a lot of work in the area of moral philosophy, so in this case we'll be talking about competing moral traditions. In order to avoid moral relativism, you have to have a way of comparing differing views on what is moral. MacIntyre talks about the way that traditions typically begin with some kind of authoritative text. Interpretations of this text are called into question when challenges arise (i.e. from a competing tradition or some new experience). The tradition is changed in some way in an attempt to resolve the conflict. Of course, this doesn't just happen once, but is an endless cycle in any tradition. Note, also, that the authoritative text is not itself changed. Rather, we come to new ways of understanding, interpreting, and incorporating our past narrative into the present day. It's interesting to think about the Bible in this light. First of all, our understanding of the Christian scriptures has evolved. Please understand that I'm not assuming every new view of the Bible is better than the previous one. It's up to us to decide what is appropriate in that regard. One of the reasons why I believe we have evolved in our understanding of the Bible is that we have simply experienced "more of God's future in our past," as N.T. Wright put it. In other words, we have over two thousand years of challenges to Christianity that we are hopefully learning from. The establishment of the canon, itself, may not have taken place if it weren't for those challenges. Another example is the way that doctrines like "the Trinity" were formed in order to combat various heretical movements. Second of all, it's interesting to think of the Bible itself as a record of the cycles mentioned above. My prophets class last quarter, for example, challenged me to think about how Hebrew prophets, living around the time of the Exile, sought to change the way the Israelites thought about God and their relationship with him. Jesus is another, superb example. He challenged the way people thought about the Law and their expectations for what a messiah should be. Next time I'll share a little more about how MacIntyre says we can compare moral traditions. Do you feel than experience and Gods word equel belief? Or is it our motivation that equels belief? Or is it like Solomon said " there is nothing new undere heaven"
I think there's nothing new in the sense that humanity stays the same...we have the problems, etc. There have been specific experiences that church has faced, however, that have changed or at least helped to qualify, the way we think.